Historical City Centre of Yogyakarta is part of the Tentative list of Indonesia in order to qualify for inclusion in the World Heritage List. I visited this tentative WHS in August 2018. I spent two nights here (1 day to visit Prambanan and Sangiran WHS) and dedicated one day to visiting some of the locations which make up this tentative WHS. What struck me most were the mostly intact city walls (top left photo) and colonial buildings which were still in very good condition compared to similar ones in Jakarta. Some highlights worth mentioning were the Vredeburg Fort, the Bank Indonesia building and the Gili Golong Monument at the central axis of both pathway locations. The OUV probably lies in two main 18th century buildings of Yogyakarta - the Kraton Complex and the Taman Sari Water Castle - both linked to the Sultanate of Yogyakarta. The Kraton is an Asian palace complex in traditional Javanese architecture style. There are two bangsal or pavilions made of teak wood with floral design ceilings (bottom left photo). The main bangsal and the inner courtyard can only be viewed from outside. In a way the kraton atmosphere reminded me a bit of the Sitorai Mokhi-Khosa Palace in Bukhara, Uzbekistan even though that had European influences. The Taman Sari Water Castle is the former royal garden of the Sultanate of Yogyakarta and had several functions, such as a resting area, a workshop, a meditation area, a defense area, and a hiding place. Taman Sari consisted of four distinct areas: a large artificial lake with islands and pavilions located in the west, a bathing complex in the centre, a complex of pavilions and pools in the south, and a smaller lake in the east. Today only the central bathing complex is well preserved, while the other areas have been largely occupied by the Kampung Taman settlement. The latter is worth visiting if only to get a better view of the water palace and city walls as well as to visit the peculiar underground mosque (bottom right photo). The ornate almost white-washed designs of the entrance gates (bottom left photo) together with the dragon staircases stand out. All in all I really enjoyed my visit to the historic centre of Yogyakarta and it would have been a great pity to skip such an interesting visit. A touristy but pleasant experience for locals and tourists alike if you sleep overnight in Yogyakarta are the LED lit cycling vehicles in the Southern City Square just outside the royal palace. If you have time on your way to/from Sangiran WHS you can also visit Solo's royal palace. The Kraton of Yogyakarta dates from the mid-18th century. 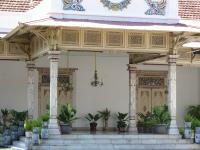 It is a prime example of Javanese palace architecture. The complex belongs to the Sultanate of Yogyakarta. Typical for the architecture is the use of a pendopo, a tall and large pavillion-like hall that is the focus of ceremonial occasions. The main gate is guarded by two statues of giants, a good one and a bad giant. The grounds also hold some (Dutch) colonial style buildings. A bit confusingly, there are two entrances that will take you into two different parts of the palace. The one on the south side is the major gateway. Entrance costs only a few thousand rupiah. Allow an hour or so for a visit. The style of Indonesian palaces, like this one and the ones in Solo which I also have visited, is very distinctive. I don't think there are any sites on the List that can compare to this. Furthermore, there aren't even any (contemporary) Asian palaces inscribed. So my conclusion would be that this would be a worthy site to enlist as a WHS.